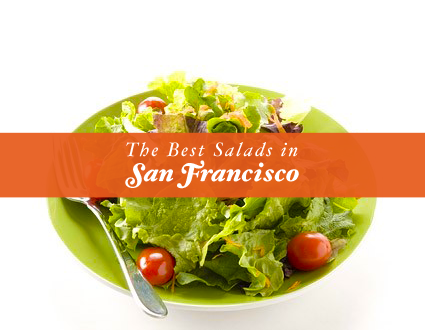 Finding the best salad for your penny in the San Francisco Financial Distract is an art. Salads can range up to fifteen dollars. For a salad that has a handful of nuts, tomatoes, onions and some leaves. You’re probably thinking, thats over priced. Well, I think so too, after I had ordered a salad at one of those “Build your own” salad bars in the city. It’s a rip off if you ask me. If you build your salads at a premium salad bar like Mixt Greens or Focaccia, they force you to add extra ingredients. They also make the menu confusing so you don’t know exactly how much money you’re putting in your salad – Until after you are at the register with your sealed plastic container full of leaves. So what’s the secret for getting a decent salad that doesn’t cost you almost two lunches in one swipe of your card? It takes a little creatvity and possibly an extra five minute walk. But hey, you’ll burn calories instead of burning a hole in your wallet. Don’t to get the custom made salads unless you’ve previously done the math and know exactly how much all your ingredients will cost you. But don’t let that stop you, you may get sucked in to wanting more ingredients than you initially asked for. The pre-made salads on the menu are just as good and usually 3-4 dollars less. Get these ones, and substitute one ingredient if you need too. Avoid the custom salad bars altogether. Food generally all comes from the same area so just because you’re not going to a premium salad bar, doesn’t mean the quality won’t be as good. The other alternative, is bring your own from home. That is honestly the most inexpensive way to purchase your lunch but a lot more time consuming. If you’re anything like me, I have a bunch of things I want to get done and sometimes building a salad to bring to work the next day slips my mind entirely. Moral of the story, don’t waste your money if you can. Save money by either bringing your own salad to lunch. Or, go to one of those smaller restaurants that will have just as good salads for less!